Free samples are available for Healthcare Professionals to give to their patients. To request any of the items listed below simply fill in the exact quantities that you require ensuring that you complete all fields marked with an asterisk* fully. Please note that samples can only be delivered to registered UK healthcare premises and not to residential addresses. 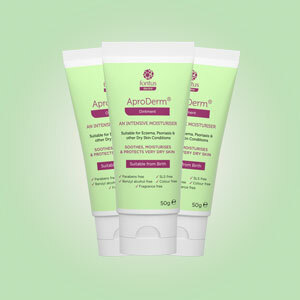 If you require more than the maximum order quantity email your name, practice details and CCG name or Trust to info@aproderm.com and our local account executive will be in touch. Please tick this box if you do NOT wish to receive any future emails containing news, offers and promotions from Fontus Health Ltd.